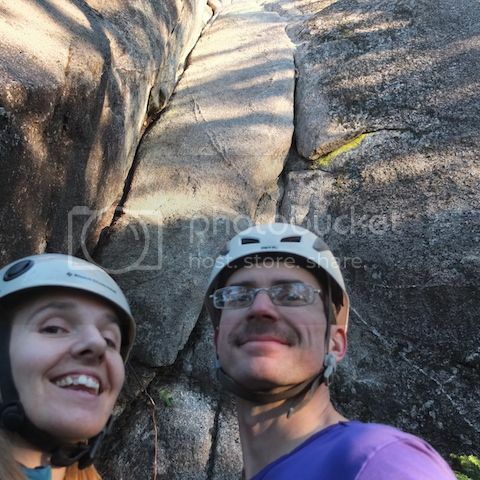 Just wanted to let folks know that I finished the cleaning and likely first free ascent of the old aid route Weeping Wall at Shannon Falls on November 15. This route is very special and I feel very privileged to have been the one to unearth it and see it develop from beneath the greenery. This route could be considered in the top ten 5.10 crack pitches for Squamish. A lofty claim, I know! Just before reaching the base of the Gobsmacking Wall, a small trail branches up to the left. 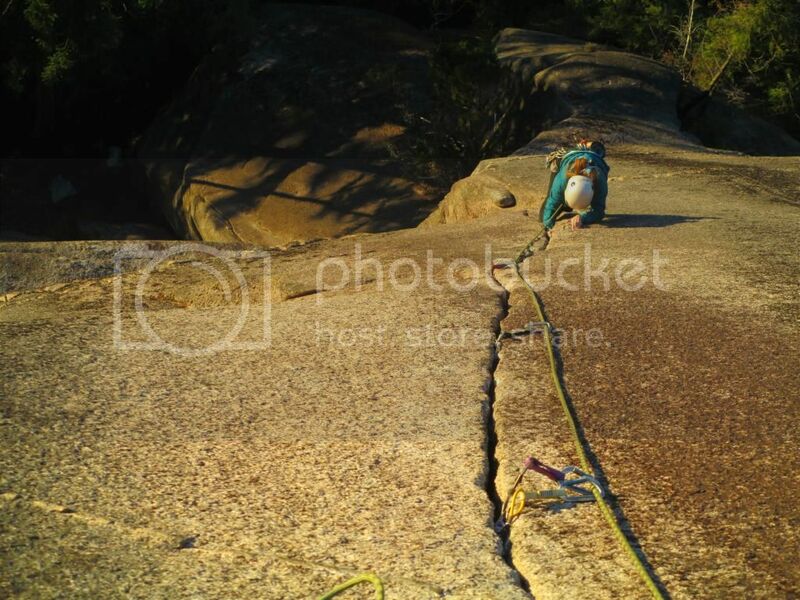 The route climbs a right facing corner for 8m before tackling twin cracks and stemming through a steep wall. the upper half of the route is a spectacular hands to fingers to tips crack which ends with several thin face moves to the anchor. Two raps with a single rope will get you to the ground. The climbers who may appear to be on the route above you, are probably on the belay at the end of the Skywalker traverse. I hope you get to check it out soon! Sounds absolutely awesome. Thanks for the work put in! Nice! Can't wait to give it a try. Thanks for putting in all the elbow grease. 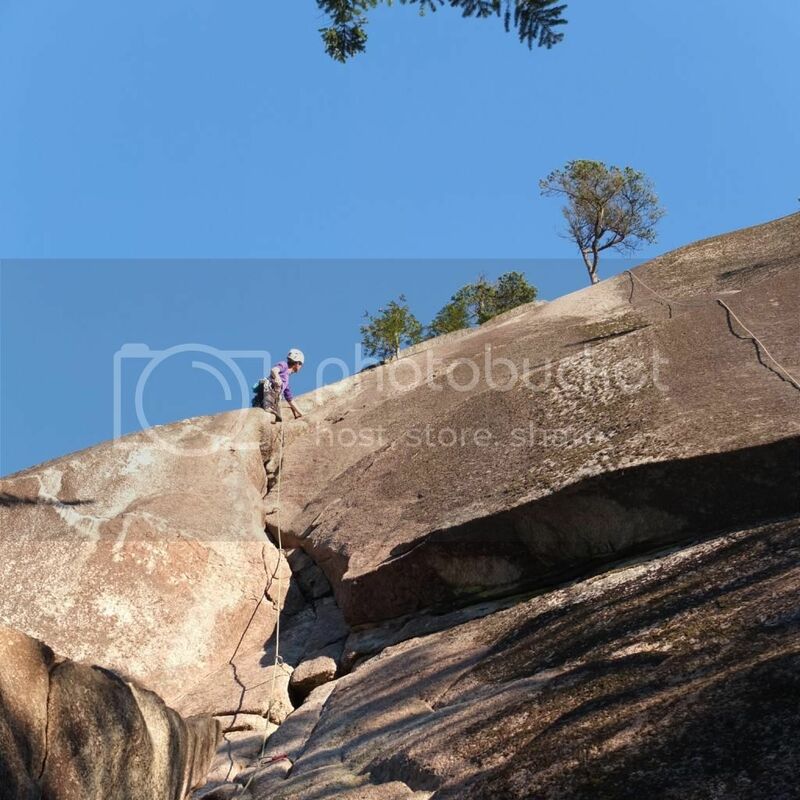 scrubber wrote: Just wanted to let folks know that I finished the cleaning and likely first free ascent of the old aid route Weeping Wall at Shannon Falls on November 15. Thanks very much and I can't wait to give it a go. I really enjoyed the retro job you gave Hanging Gardens on the Papoose, too. Here are some pictures of the FA back on November 15. A proud start to Movember, despite a ban on spousal kisses until it's gone. Looking down the amazing crack. The crack peters out, and a few face moves ensue. 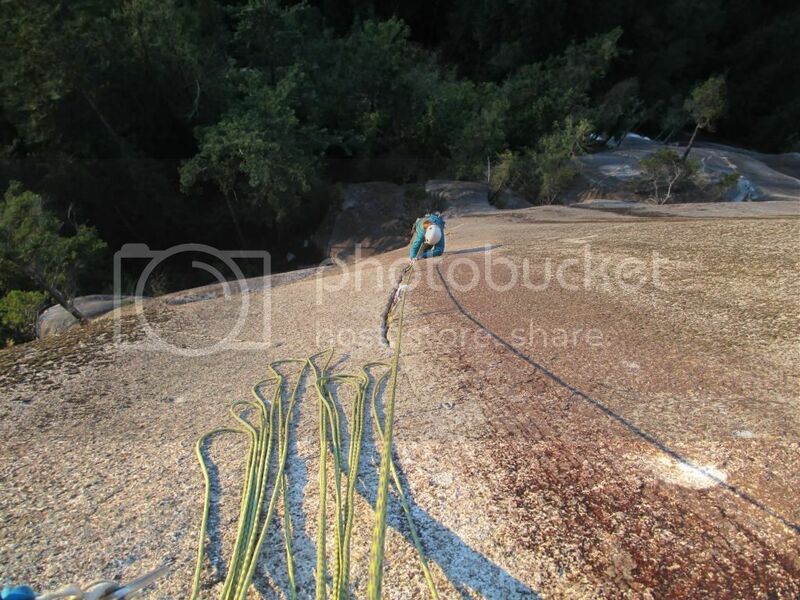 Hmmm, Photobucket seems to have cropped the images. If you click on them you get the whole picture, but they're not entirely visible here. Here's a more centred one that shows the crack in its entirety. Jen is standing in the same spot than i am in the second picture of the preceding post. Climbed this route today and the quality is outstanding. Splitter hands to fingers to the last moves. Equal to Arrowroot or exasperator. The exit however is extremely exciting and thin. it certainly would be VERY nice to have the 1/4" bolt replaced with a nice 3/8" to protect the final moves. I was able to use my metolius nut tool to clip the 1/4" bolt and clip a draw to that. Otherwise extremely spicy. Super climb though. Yeah, I was turned off by the finish on Saturday. 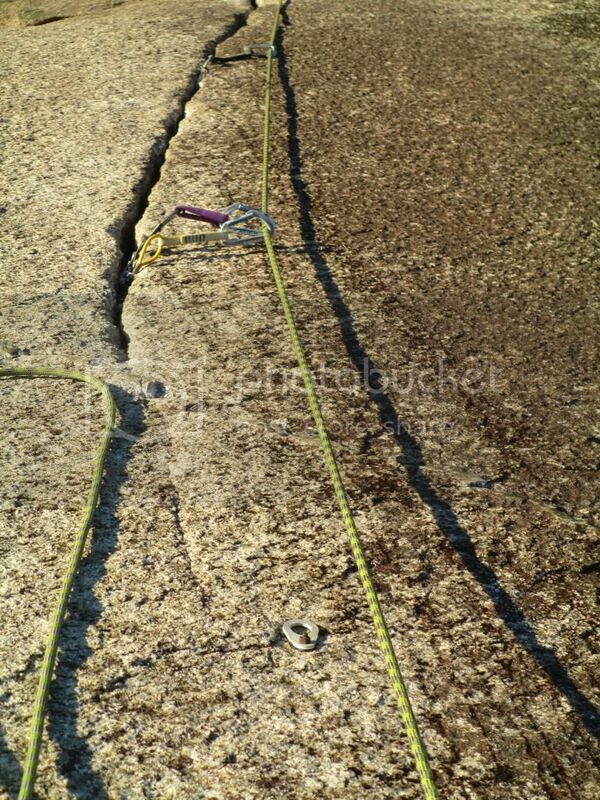 I'd been planning to try out this new crack after a lap on Skywalker, but after seeing that the anchors were placed 10-15 feet above where the crack peters out (and that the techy section was much steeper than it appeared in the pictures) I lost my nerve. I also wished there was a bolt where the old aid bolt was hanging, but I'm not one to tell a scrubber how to set his routes - just giving some feedback. I whipped on it twice when leading it earlier this spring. All of the crack climbing leading up to the slab crux is really good! We climbed this route a couple weeks ago and I thought it was great with a nice sting in the tail on a humid, sweaty foot day.. I liked the run out, it gave a good challenge with 40 meters of rope weighting you down. Good job! another Gobsmacking Wall classic. Thank you for unearthing this stellar line! 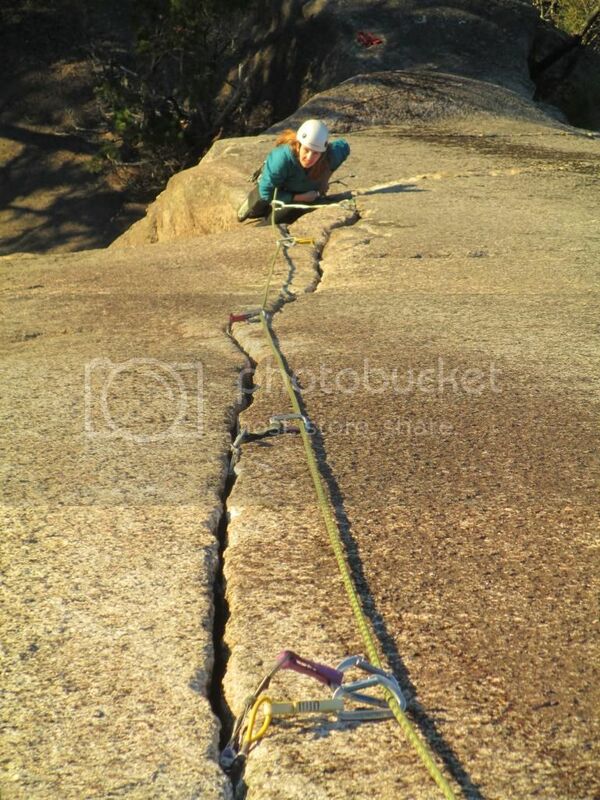 I concur with the claim that this is arguably one of the best crack pitches in Squamish. Given that, having a runout slab crux finish seemed out of character with the true pleasure of the route (climbing the beautiful cracks) and detracts from its appeal, in my humble not-a-fan-of-runout-slab opinion. A bolt in the vicinity of the old aid ring seems to make sense, both in terms of updating the route and tipping a hat to its history. Glad I tried it once but will forgo repeating it unless a bolt is added. I appreciate the hard work and vision that went into opening this route up. Thanks for cleaning an awesome climb !We did it in two pitches just to make it easier for the belayer to watch the leader climb and communicate plus maybe getting less rope stretch when falling. So the 2nd pitch is great no need for an extra bolt took multiple whippers on a BD 0.4 and it was fine. Slabs are suppose to be run out people we're in Squamish! I did find 10c to be a bit stiff for the second pitch but going from crack to slab is always tricky. As for the first pitch I love the transition from going to first pitch to the second if you ended up splitting it in half, really fun ! Thanks again ! Thanks for the feedback everyone. I'm glad you enjoyed the climbing. I'd like to hear some more opinions before deciding whether or not to add a bolt at the top. With the bolt, it will be a very sterile experience. Without it, there is the potential for a clean fall with bomber gear at or just below your feet. Definitely not what you may think of as a "slab fall". The moves are face climbing on less than vertical rock. A few more thoughts to add to the "debate," for what it's worth. I can appreciate the merits of both sides: a spicy finish showcases the face climbing, a bolted face let's the long crack system be the star of the show. One consequence of leaving it without a bolt could be that it appeals to a smaller audience and so it will get less traffic. While the prospect of a fall ups the excitement factor for those define a good route by that standard, the people who have asked me about it after seeing the freshly cleaned crack quickly say "no thanks" when I tell them that the crux is an unprotected slab finish. Of course, this is not going to be everyone's response, but just something to throw out there. Another thought is that if an unsuspecting leader is lured onto the route by the part of it they can see from the ground -- the crack -- they could be in for an unpleasant surprise once they hit the cruxy blank area between them and the anchor. If they are unable or unwilling to make those final face moves, it is not a simple matter to be lowered off from that last piece of gear with a 60m rope. While you don't have to look far to find endless options for slab climbing in Squamish, both well-protected for the timid and runout for the adventurous, the crack portion of this route is unique and it is what will make people seek it out. I doubt climbers will flock to a new route simply for the opportunity to get scared or hurt on a face left intentionally unprotected even though it had an aid ring originally. And a final thought... I know a few folks who are route developers from back in the day. When they put up their routes decades ago, they kept in mind that they'd eventually not feel so bold or strong as they did at the time and wanted to develop routes in a way that they could continue coming back to enjoy them even as their own youth faded. It turns out that the masses agree; their routes have become the classics. I hope you get more feedback to help in your decision about the legacy you want to leave with this route. While I am voting for a bolt for mostly selfish reasons (what climber isn't selfish? ), it really doesn't matter what I think because I did not put in the hard work to clean it and there are plenty of other routes out there to climb.